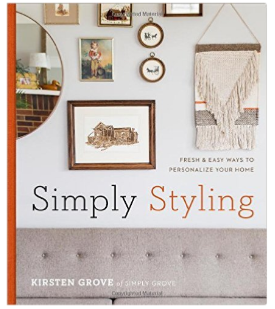 Trends To Stay: Green & Gold in the kitchen, bathroom, living room and more. We are always inspired by something. Colors, textures, destinations…anything can bring inspiration! Green and gold is one of those partnerships that brings immediate beauty. 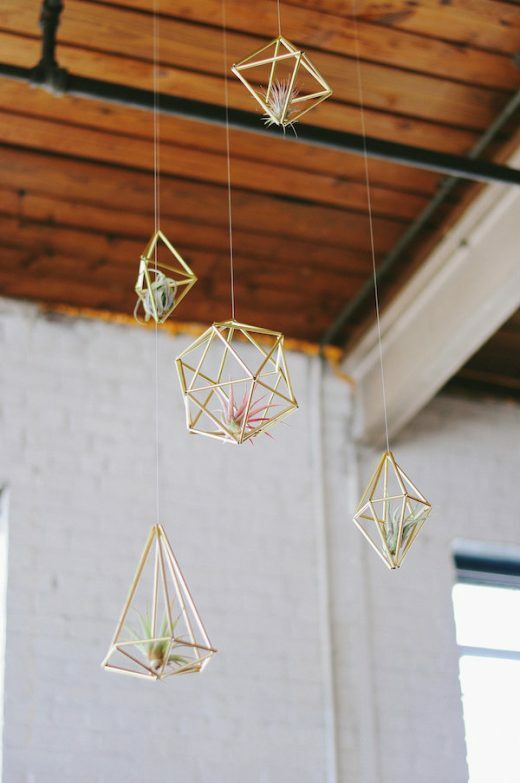 There’s a large spectrum of ways to incorporate green and gold into you home. You can go bold, subtle, or anywhere in between. 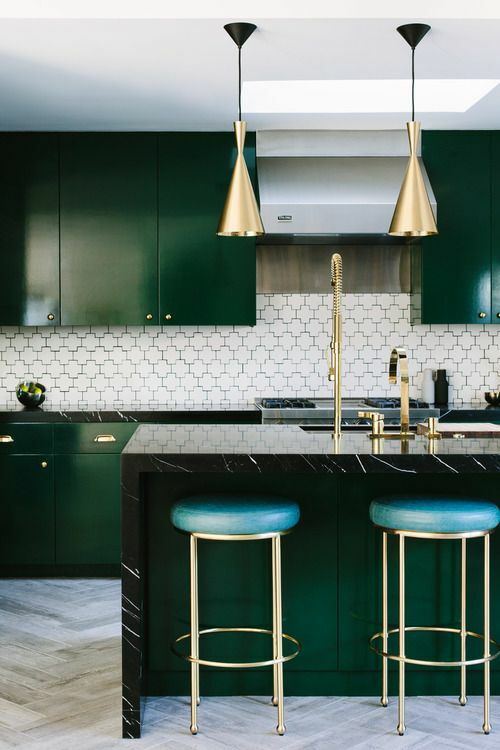 Bold green and gold accents have been looking fly in kitchens! 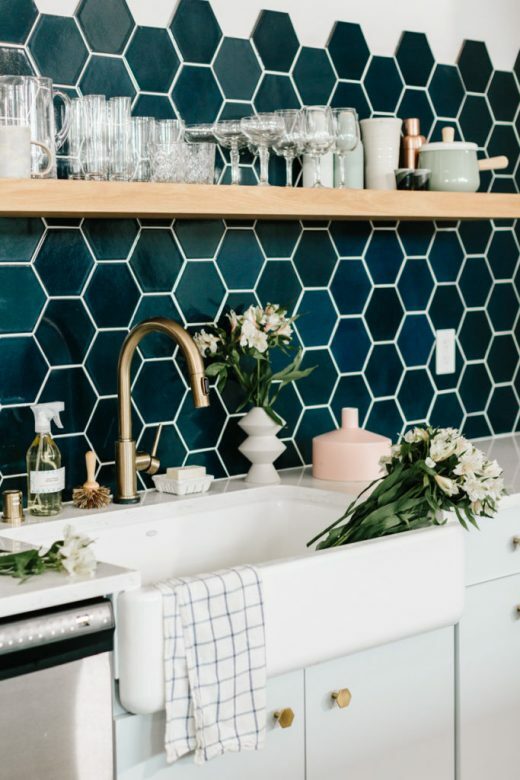 I’m especially loving the rich green cabinets, from the first image, as well as this fun meets elegant kitchen backsplash. And look at these faucets… Love! 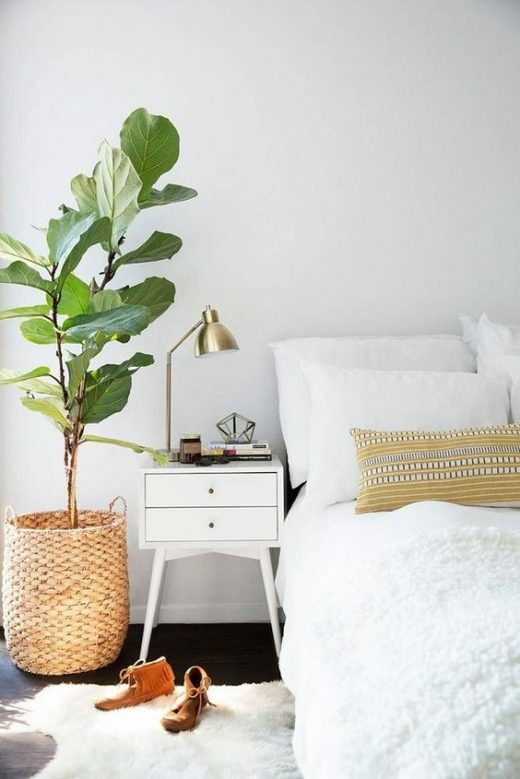 These two bedrooms are great examples of how you can play down or up with the green and gold theme. The first image is subtle and so timeless, with a green plant and a gold piece juxtaposed against a white wall. 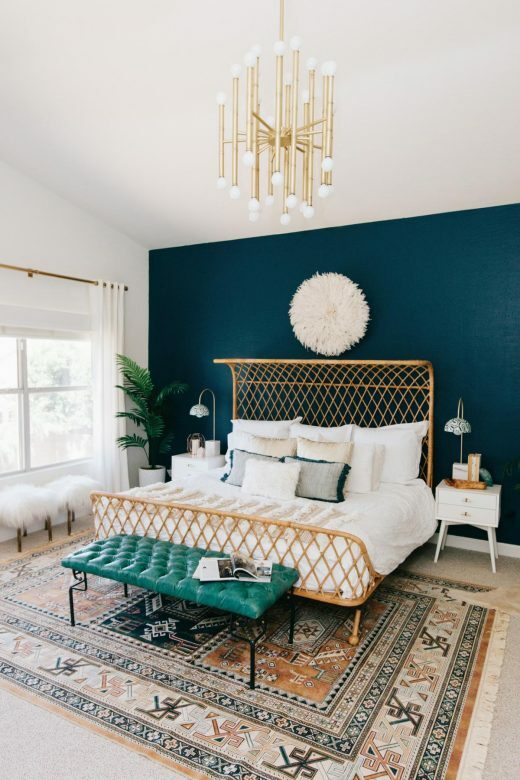 The bottom example has the dark teal accent wall, which is a fun and easy way to go bold without over-doing it. 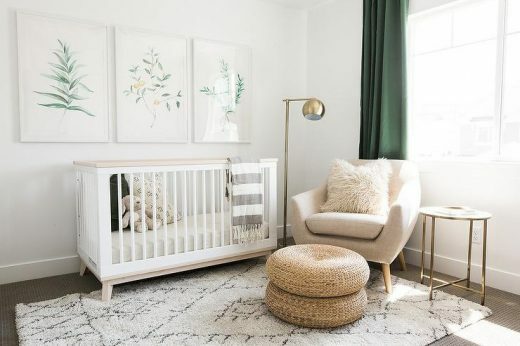 I certainly wouldn’t mind spending time with a sweet babe in this gorgeous gender-neutral nursery room. Velvet seating is all the rage right now. 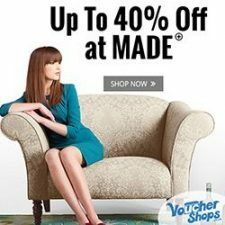 Haven’t we all become a sucker for a velvet couch?! 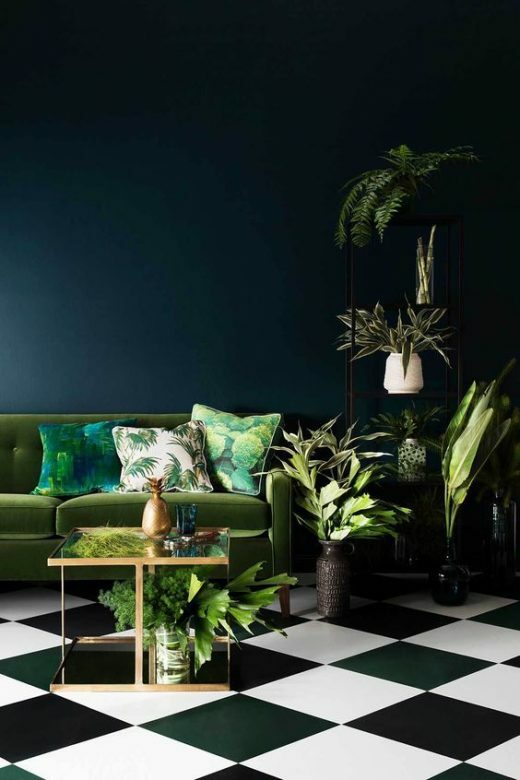 The forrest green velvets are stunning. Staying with the theme, the best counter part for these couches is either a simple gold coffee table or gold lamp. 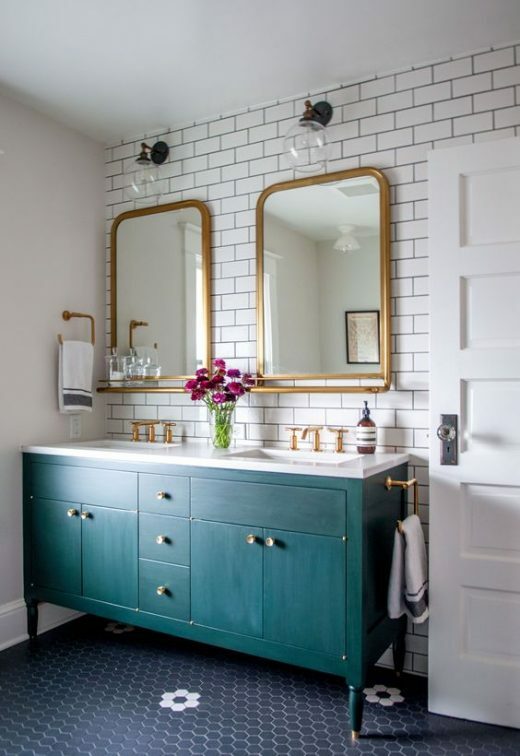 Gold framed mirrors, gold faucets, green cabinets and white subway tiles, oh my! This bathroom gets all the heart eyes. via HonestlyWTF. 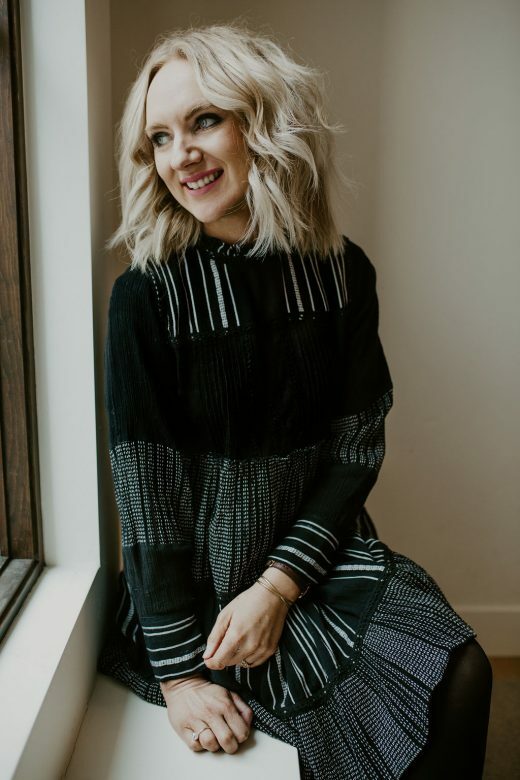 Produced and styled by Bianca Sotelo. 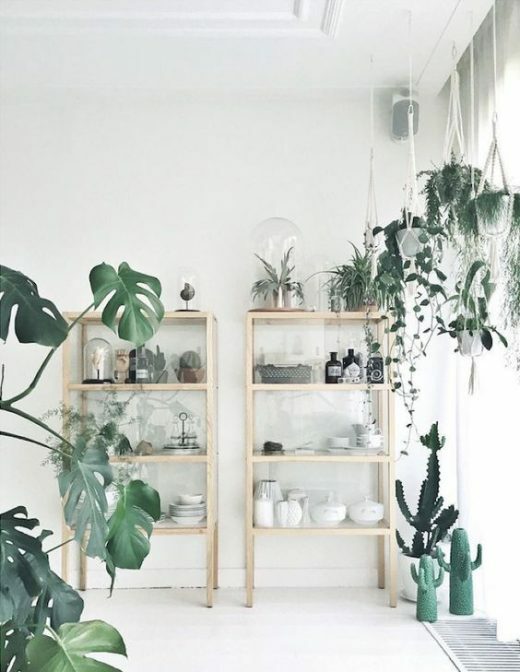 Lets not forget about plants, the most natural green you’ll find! 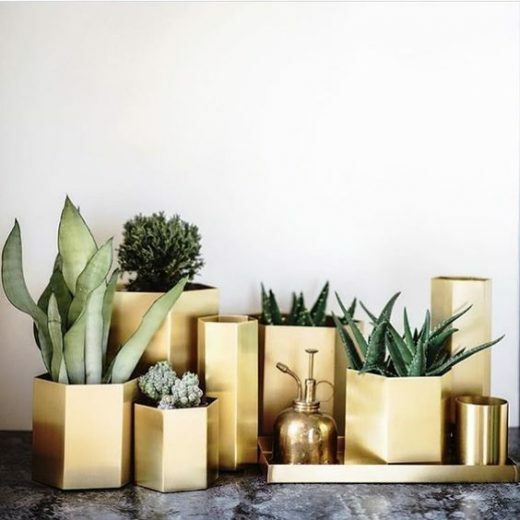 Try displaying you green plants alongside your gold decor or even better, on gold selves. Don’t have a lot of gold decor or gold shelves? No biggie, find yourself some gold plant hangers and pots. I think I’ll be dreaming in greens and golds for a while after this but no complaints here! I never thought I’d find myself loving green & gold together so darn much. These spaces are BEAUTIFUL! I especially love how that bar cart is decorated – that paint is fantastic! Right!? Greens and Gold have been making my soul happy. So happy you are enjoying the trend too Gabriella! 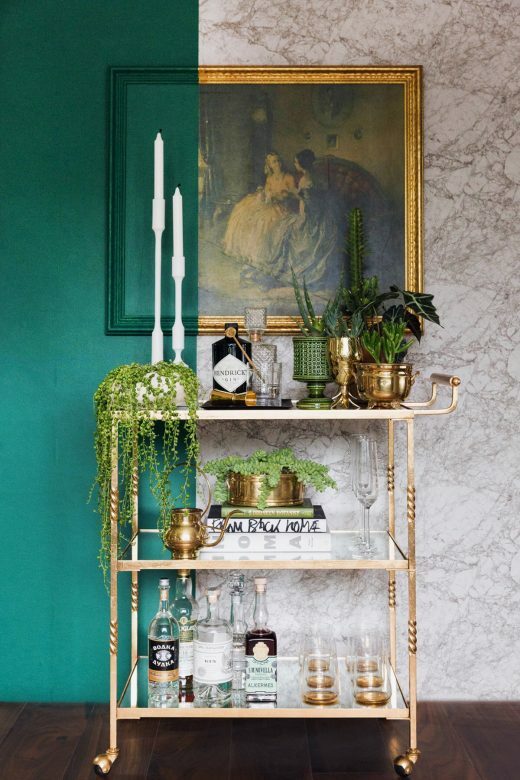 And you’re totally right, that bar cart is so swoon-worthy!! Haha too funny Phyllis! Love it. Most of the time I thought about my home or bathroom renovation with new colors or so. I just can think about black and white. I don’t know why this is happened to me. But this is the first time I realize about the green and gold combination and you know what? I completely gone mad with it. I must think about it for the next renovation. Great post!! This combination is looking new to me. But, gorgeous enough to think about the simple renovation. It will be fine! Love the idea of gold faucet, cabinets and what about a golden color shower curtain? This is a looking beautiful. Your simple renovation is very nice combination your gold faucet. I love golden color shower curtain. 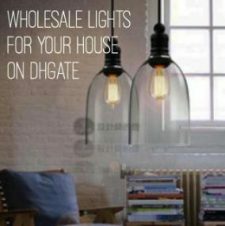 Thank you for share a such beautiful post. Guess what happens – I enjoy golden shade shower window curtain and the mix of your rare metal faucet is actually amazing. Today its seeking very stunning. Thanks for this phenomenal post. My spouse and I never considered I’d locate myself adoring green and also gold collectively so hellfire and brimstone to much. These kinds of spaces are usually BEAUTIFUL! My partner and I especially adore how in which bar wagon is furnished – this paint will be fantastic! Appreciate your sharing this publish!! This mixture is looking not used to me. However gorgeous plenty of to think about thinking about renovation. It can be fine! Like the idea of platinum faucet, cabinetry and what of a golden coloring shower drape?